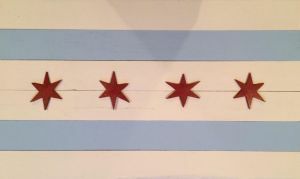 Own a piece of history: Here is the finished product of our hand-made 2' x 3' Chicago flag, produced in the garage of CPD Chaplain Fr. Dan Brandt's brother, Bill. Making these flags is--as you see--quite labor intensive, with CPD officers helping in the process to honor those who have gone before us. As Bill Brandt says, "It's a labor of love." Fr. Dan Brandt's thumb print is on the back of each flag, as are hooks to hang it. Recommended for indoor use. Proceeds from the sale of these flags will support our ministry to Gold Star Families: the 574 families here in Chicago who have lost a loved one in the line of duty.